The day started sunny and cloudless, although later in the day it became cloudy and then mist came down, slightly spoiling our views on the way down into Griesalp. 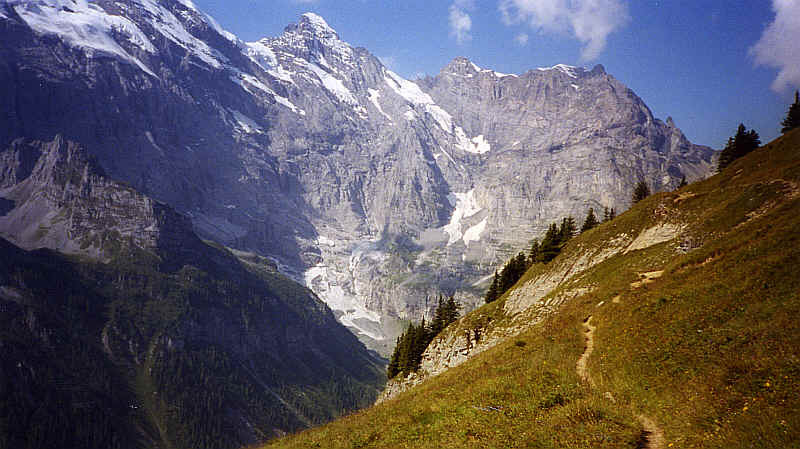 We left Lauterbrunnen on the funicular to Grutschalp and then, to save time, took the train to Murren, saving an hour or so walking on the level path above the valley. 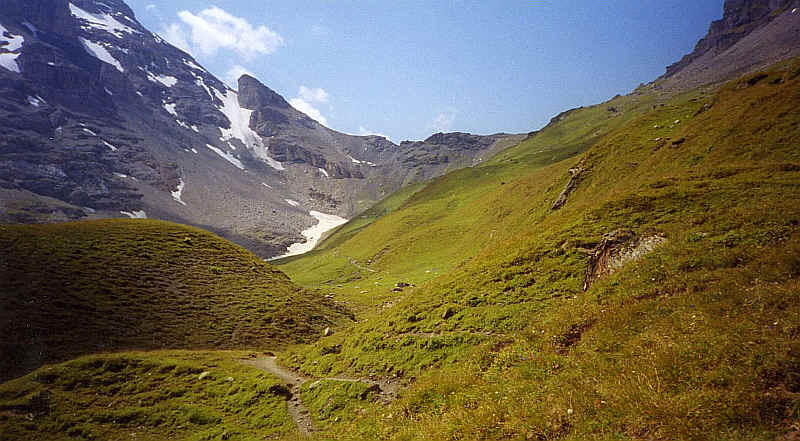 Leaving Murren the path climbed fairly steeply through meadows and then very steeply up a ridge leading towards a corrie below the Shilthorn. 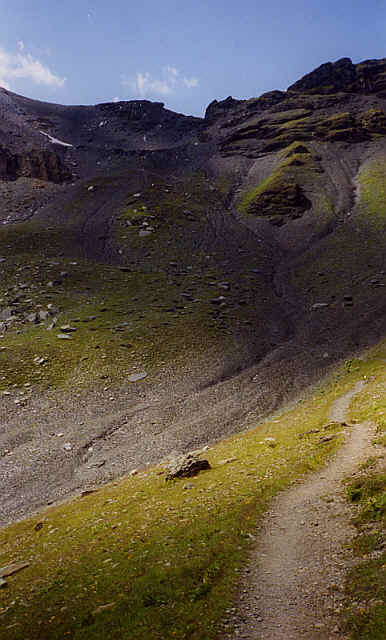 The path levelled off and then fell slightly to the Rostockhutte, which is a mountain hut and café. We had milk and visited the first of the mountain hut toilets – not a particularly pleasant experience! 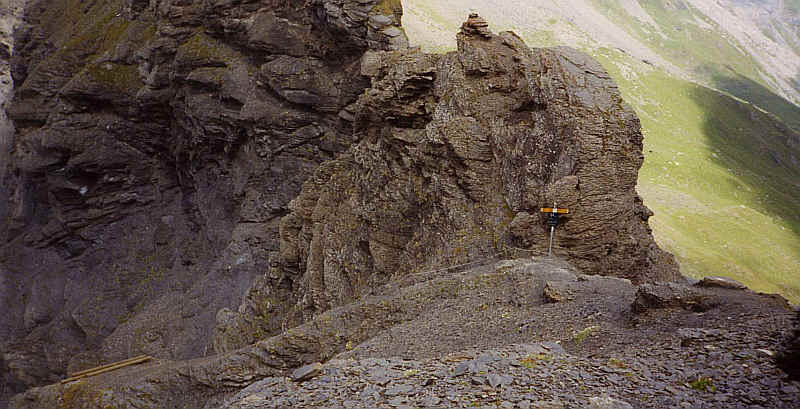 The approach to Sefinenfurgge from the east and yes, there is a path up there! 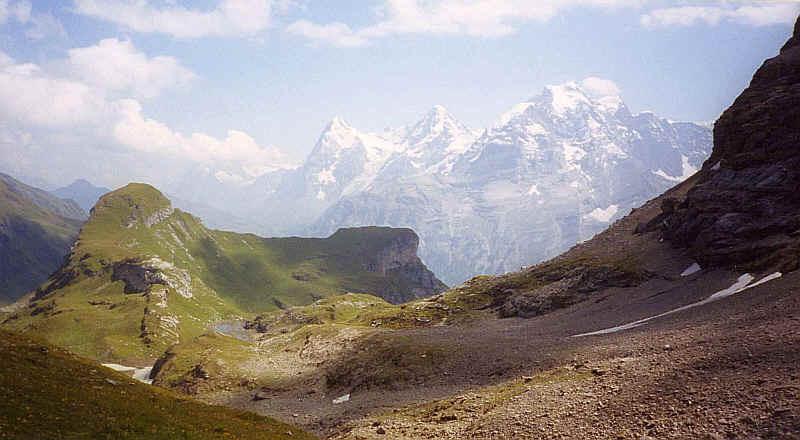 Looking back to the Eiger, Monch and Jungfrau from just below the Sefinenfurgge. 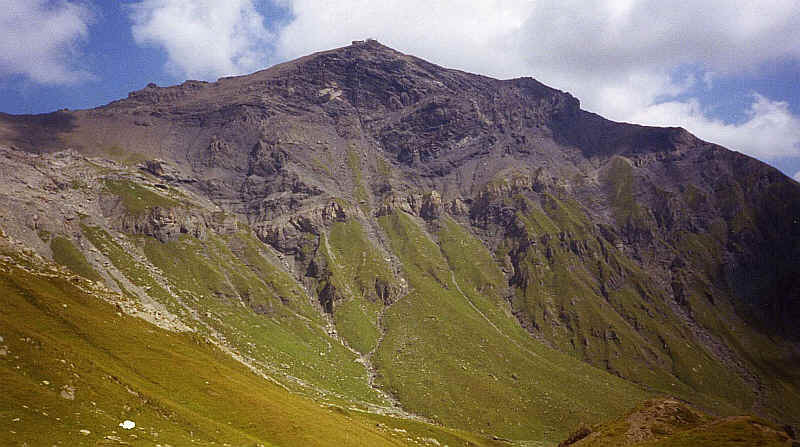 The Sefinenfurgge (2612m) itself is almost an arête, with less than 2 or 3 metres of level ground and entirely composed of a grey shale-like rock, a rather frightening and forbidding place. We had lunch at the pass and tried to psych ourselves up for one of the most difficult sections of the APR, the descent down to Griesalp. 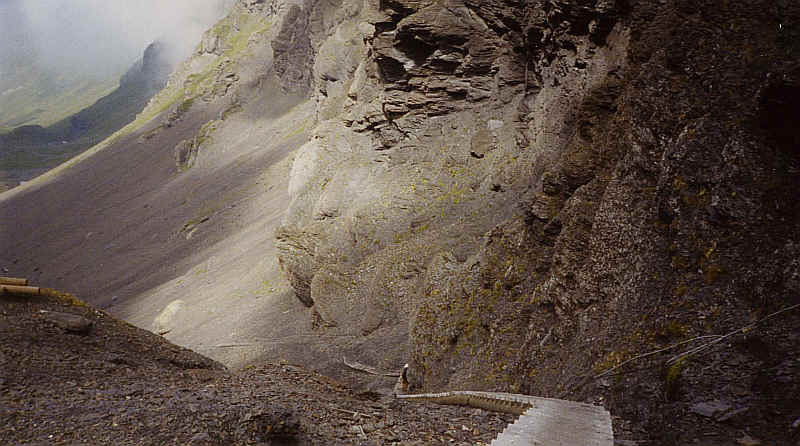 The first 30 feet or so were rather exposed over a sloping rock slab but a steel rope gave some help and then there was the ladder…………… This is literally a wooden ladder about 400 metres long set at about 30 degrees and laid onto the scree slope. It was put in place a few years ago after the path became too eroded. A wire rope gave some extra security but as rockslides had destroyed sections of the ladder it was a slow and tricky descent. 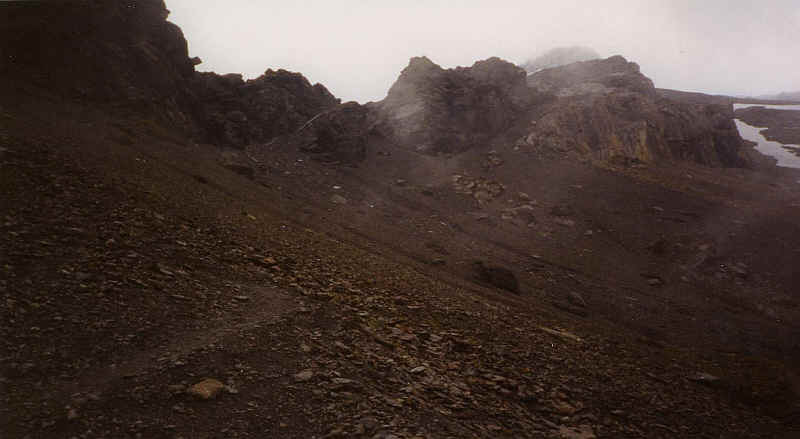 Looking back towards Sefinenfurgge with its tremendous scree-slopes. The ladder can just be seen near the top.